This easy sour cream coffee cake is super easy to prepare with a cake mix. 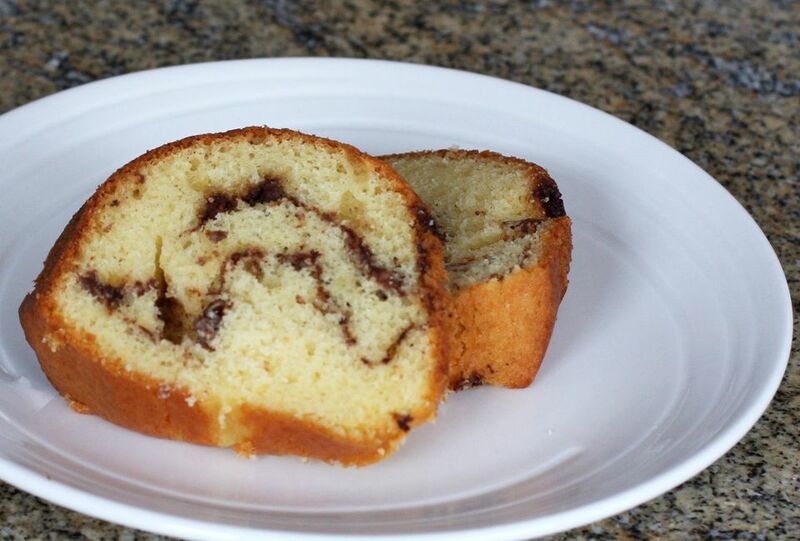 The cocoa swirl mixture is made with cinnamon, brown sugar, and chopped pecans. The sour cream gives the cake fabulous flavor, and the cinnamon, cocoa, and pecan swirl makes it extra-special. Bake this wonderful coffee cake, and take it along to the office or a morning meeting. Your coworkers will thank you! Generously grease and flour a 12-cup Bundt cake pan, covering all of the nooks and crannies. In a small bowl, combine the chopped pecans, brown sugar, cinnamon, and cocoa; set aside. In a mixing bowl combine the cake mix, sour cream, and vegetable oil; beat until well blended. Beat in eggs, one at a time. Beat with an electric mixer on medium speed for 2 minutes. Pour about one-third of the batter into the prepared Bundt cake pan. Top with half of the pecan and cinnamon mixture. Spoon another one-third of the batter over that layer — don't worry about covering the nut layer completely, it will spread during baking — and top with the remaining nut mixture. Spoon the remaining batter over the nut layer and spread very gently. Bake for about 1 hour, or until the cake bounces back when lightly touched with a finger. Cool the cake in the pan on a rack for 10 minutes. Carefully invert the cake onto the rack to cool completely before slicing.